The DropMix Music Gaming System includes the DropMix board and 60 DropMix cards, and the free downloadable app controls the game. 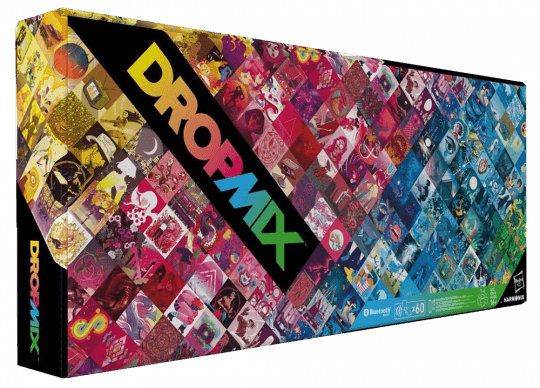 The included DropMix cards let you mix songs from top artists, including: Bruno Mars, Childish Gambino, Disturbed, Ed Sheeran, Imagine Dragons, Sam Hunt, Sia, The Weeknd, and more. There are also Discover Packs and Playlist Packs to expand the mix possibilities with more DropMix cards. Dominate the mix & beat your opponent(s) by reaching 21 points first. Keep the flow going as you explore combos and compete 1 v 1, 2 v 2, or 1 v 2. The mix is dynamic and changing as you drop your choice of tracks onto the board. Out-maneuver and strategically play your cards as you face off, all while busting out unexpected musical mixes! Work together to answer requests quickly and light up the board with your high score! Gather a group of your friends and have a blast collaborating and creating an ever-changing stream of music mixes. Immerse yourself in the unexpected and exciting rhythms that you and your friends create! Freestyle mode puts the pure power of DROPMIX’s music-mixing technology in your hands! Discover amazing new music by connecting some of the world’s top artists in ways you never expected. Customize and tweak the mix until you have exactly the sound you are looking for. Then show it off to your friends! You won’t believe how easy it is to build innovative and blended beats!